Colt Model 1908 Vest Pocket .25 ACP Serial Numbers 1 & 2 with original August 25, 1896 patent and 1909 Colt Catalog. © Sam Lisker, All rights reserved. 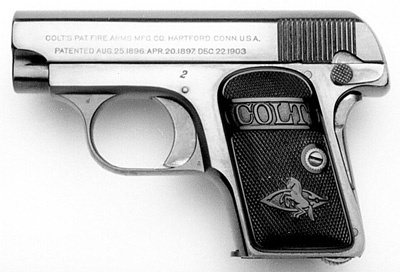 Colt’s Model 1908 Vest Pocket .25 ACP pistol (or “Model N” as it was referred to internally by the Colt factory) is perhaps one of the more interesting Colt models to collect. It was manufactured from 1908 until just after WWII, with the last pistol being shipped in 1948. Throughout production, there were a significant number of standard production and factory embellished variations of this model. Due to its size and small caliber, there is a relatively high survival rate of Vest Pocket .25s in better than average condition. While the highest serial number was 420,705, the total production numbered approximately 409,000 pistols making it one of Colt’s best selling commercial automatic pistols. Until World War II, the Colt 1908 Vest Pocket was Colt’s fifth most popular model. It was only outperformed by the 1903 .32 ACP and Model of 1911 U.S. Army .45 ACP automatic pistols and the Official Police and Police Positive Special revolvers, four models for which there were large military contracts and police orders. Collectors most frequently encounter six and occasionally five-digit serial number examples of the Model N. Seldom are four, three and two-digit serial numbers encountered. Single-digit serial numbers are almost unheard of. Pictured on this month’s cover are two very unique Colt Vest Pocket .25 pistols: serial numbers one and two. They are perhaps the only set of pre-WWII first and second consecutively serial numbered pistols that exist in the same collection. Model 1903 Pocket Hammer .38 ACP serial numbers 19999 and 19998 (which were the first and second guns of this model produced) were at one time in the same collection, but today, their whereabouts are unknown. 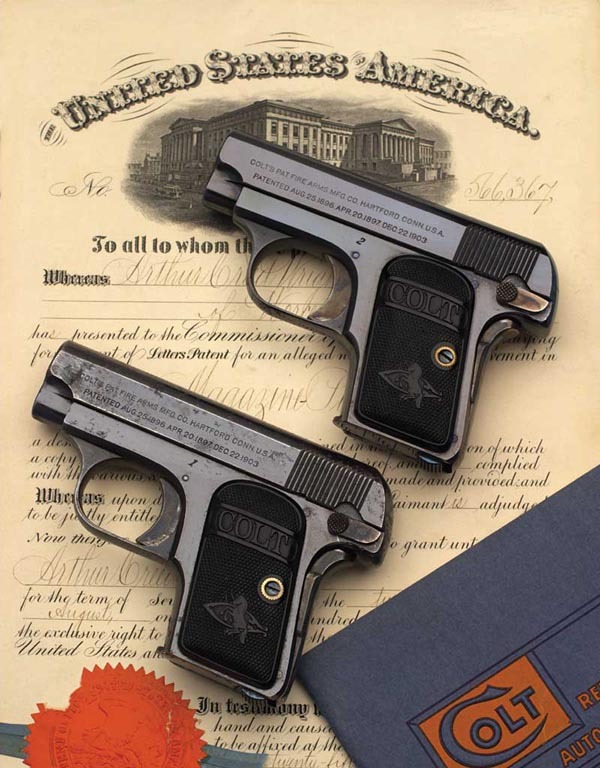 As would be expected with the earliest single-digit serial numbered examples of a new model, serial numbers one and two were shipped to two very well connected individuals who had important relationships with Colt’s. Serial number one was shipped to noted collector J.R. Hegeman. At one time, Hegeman had one of the most outstanding Colt collections in this country. He was truly a pioneer in Colt collecting and presumably had some fantastic connections within the Colt company that allowed him to own many pre-production, prototype and serial number one guns. Many of Hegeman's Colt's are now part of some of the finest collections. Number one was assembled on October 30, 1908 and on November 28, 1908, it was shipped directly to Hegeman in a single gun shipment. Mr. Hegeman, a vice president of the Metropolitan Life Insurance Company, of New York, was a very active collector between 1885 and 1925, and was interested only in Colt arms. Also pictured with this consecutive set is the original Arthur Creed Wright Patent No. 566367, granted on August 25, 1896, and an original 1909 Colt catalog. The August 25, 1896 date is the first patent date that appears on the slide of Colt’s Model 1908 Vest Pocket pistol and is the earliest patent date to appear on any production Colt automatic pistol model. The 1909 Catalog was the earliest catalog to feature the Colt Vest Pocket .25. Colt Model N Serial Number 1. A one gun shipment to noted Colt collector J.R. Hegeman on November 28, 1908. Mr. Hegeman, a vice president of the Metropolitan Life Insurance Company, of New York, was very active between 1885 and 1925, and was interested in Colt arms only. Hegeman was truly a pioneer in Colt collecting and presumably had some fantastic connections within the Colt company in order for him to own many production prototype and serial number one guns. 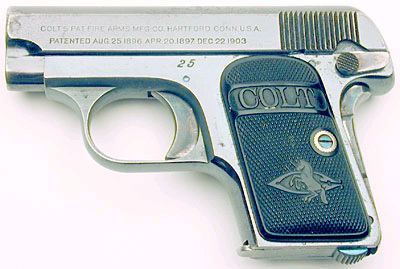 Colt Model N Serial Number 2. A one gun shipment to Colt's Treasurer Frank A. Schirmer on 11/24/08. Schirmer also received the first Model M .32 shipped. Colt Model N serial number 25 - A single gun shipment November 20, 1908 (the first day of commercial shipments) to A.M. Holter Hardware Company, Helena, Montana. Serial number 25 predates the shipping dates for both serial numbers 1 and 2. The gun is an interesting example as the serial number matches the caliber. Colt Model N Serial Number 400000. One of a two gun shipment to W.H. Hoegee Co, Los Angeles, CA, June 15, 1936. 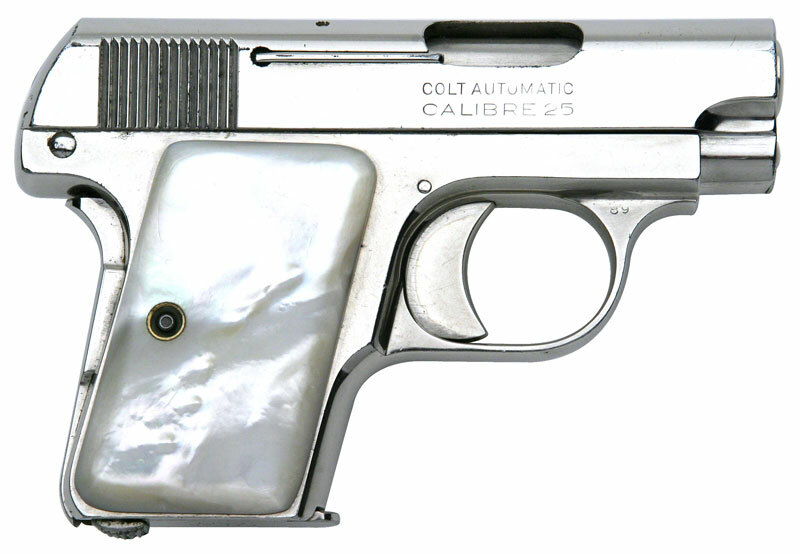 Colt 1908 Vest Pocket .25 ACP serial number 430467 - factory nickel finish, aftermarket mother of pearl grips. Gun is unusual in that it the serial number is approximately 10,000 numbers higher than the highest recorded production serial number, 420705. This appears to be the result of a factory numbering error at the time of production as the matching slide is numbered 340467, meaning that the first two numbers of the serial number on the frame were unintentionally transposed. Colt 1908 Vest Pocket .25 ACP serial number 430467 - slide is numbered 340467. 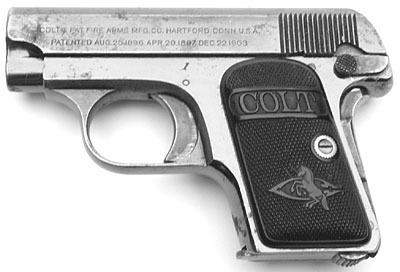 According to Colt's Historian, 340467 is recorded as a gun with factory nickel plated finish. The Historian also indicated that there is no notation in the production records regarding the serial number discrepancy between the slide and the frame. In the case of a misnumbered serial number, Colt's would often restrike a number over the incorrect number in order to correct the error. 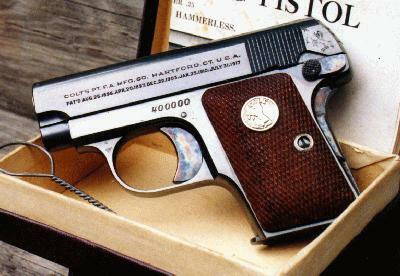 Pistol was one of 10 shipped to Belknap Hardware & Manufacturing Company, Louisville, Kentucky, December 17, 1923. 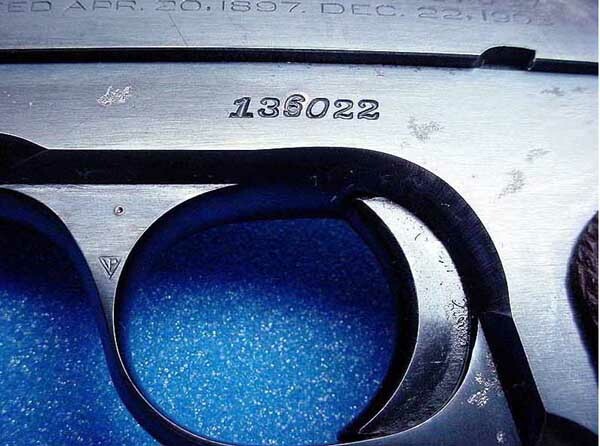 An example of a Colt factory serial number overstrike to correct in an incorrectly numbered gun. Note the "6" over the "5" above. 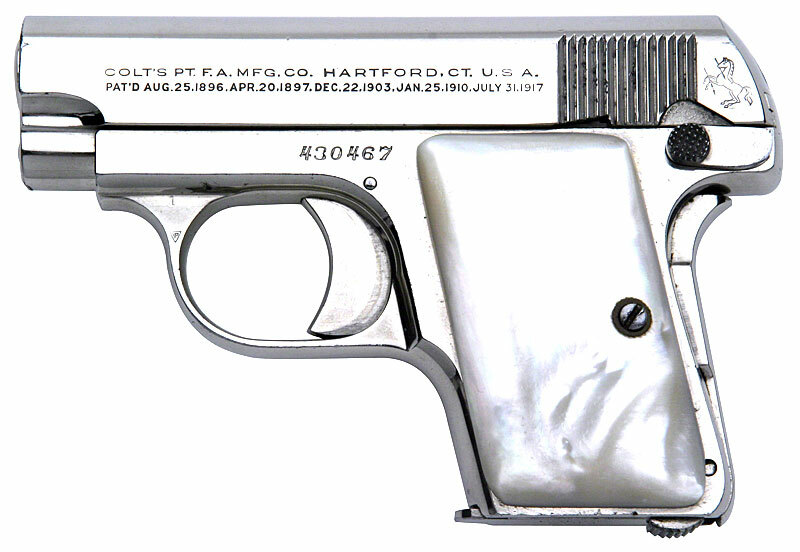 Colt 1908 Vest Pocket .25 ACP serial number 430467 - factory nickel finish, right side view.